Nowadays, there are a wide variety of fifth wheel trailers on the market that incorporates power generators into their designs. While these generators could sustain ordinary electric devices, they are not exactly ideal choices if you want the best fifth wheel generator for your vehicle. In fact, many RVer opt to replace the original generator of their recreational vehicle as soon as the situation allows. That being said, with so many 5th wheel generators available for purchase, how could you tell which one is more suitable to your camping setup? Well, in the case guidance is what you need, you come to the right place. This article contains everything you should keep in mind while looking for the best generator for RV money can buy. From shopping tips and tricks to useful information relate about 5th wheel generators, you would find them all down below. As the purpose of the generators is to keep your RV appliances and gadgets running, the first thing you must consider is the power output. Large size RVs often have multiple electric devices that could keep your life comfortable but the power consumption rate could get pretty high as well. In order to make sure that you secure an appropriate power generator, take some time to estimate how much power your fifth wheel trailer requires. Once you are done, use the result to figure out what kind of output you need in your power generator. In some case, it may worth the effort for you to prioritize pure sine wave power generators over standard models. 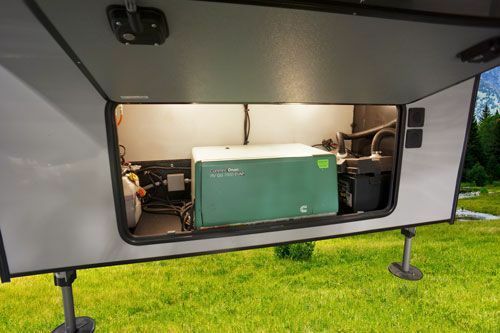 Able to provide electric devices with “clean” currents, these generators are great solutions for RVers living in the technological age. As Macbook, iPhone and similar electronics are sensitive when it comes to power, go for pure sine wave generators if you want peace of mind. On the other hand, pure sine wave generators are a bit pricey but given the benefits they offer, your investment would be well-spent money. Needless to say, no one wants to camp and sleep around a noisy power generator. Using a noisy generator in populated RV parks and boondocking areas would earn you nothing but the ire of other RVers in your immediate surroundings. Therefore, it’s strongly advised that you take the noise into account while shopping for the best fifth wheel generator. Most modern day 5th wheel generators are specifically designed to keep the noise down but some models just happen to be quieter than the rest. For your information, human breathings are rated at 10 decibels and regular conversations linger around 50 decibels. In most of the case, the maximum limit of noise in national parks and private campgrounds is 60 decibels at 50 feet. As the power output goes up, so do the decibel and that means you have to find the right balance. The best fifth wheel generator for your RV must be strong enough to keep your stuff running while remains quiet. There are 3 types of fuel a fifth wheel generator could use: Diesel, Gasoline and Propane. Because the availability of fuel varies from place to place, you must ensure that your generator uses a type of fuel that you could supply. For most of the time, it’s widely recommended that you secure a fifth wheel generator that uses the same fuel as your towing vehicle. While you are at it, assess the fuel consumption rate of the generator as well. You definitely don’t want to see your generator exhaust all of your fuel supply. Here is something you have to know about generators that run on common fuel types. Stable and efficient, diesel generators are well liked by people in need of consistent power. However, the number of models is quite limited so you don’t have a lot of choice on the market. Furthermore, diesel generators could get slightly noisy while in use. All things considered, gasoline is essentially the most prevalent type of fuel on the planet. 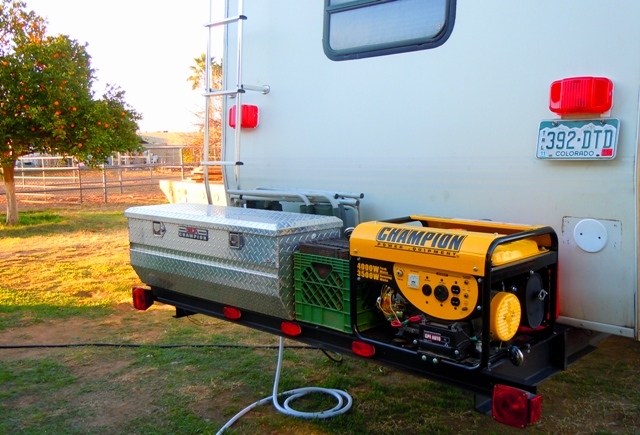 Hence, it comes as no surprise that there are multiple models of gasoline generators for RVs like fifth wheel trailers. You should be able to obtain gasoline without much difficulty, the price of this highly popular fuel is also reasonable. On the downside, gasoline is flammable and it doesn’t have a long shelf life. Compared to other types of fuel, propane has a considerably longer shelf life and propane generators usually produce cleaner emissions. In exchange, power generators that run on propane tend to have a limited tank size which means they may not last through the entire trip. Moreover, propane is hard to come by in many places so it could get difficult when it comes to refueling. As the name suggests, onboard generators spend most of their time on the 5th wheel trailers while portable generators could be moved at moment notice. Some people love to use an onboard generator because there is no need to do anything besides pushing a button. From maintaining to refueling, you could do everything from the inside of your recreational vehicle. You don’t have to worry about the weather and thief which should let you enjoy yourself to the fullest. That being said, portable generators have their perks as well. As they could be moved from spot to spot, they are able to power other application in times of need. In addition to that, a couple of portable generators models have a versatile parallel capability. That means two similar units are capable of working together and the result is a significant increase in power output. In conclusion, there is no winner in the competition between onboard generators and portable generators. Different people would have different taste so try to make up your mind base on your own needs and requirements.